He will ask, quite properly, what’s wrong with you. But he should confirm that scepticism is normal, that if you need to overcome scepticism, evidence works well and, for God’s sake, don’t accuse sceptics of being unbalanced. Oh, wait; that’s exactly what Victoria University plans to do. See this brochure. Brochure for upcoming VUW lecture in South Auckland on climate change (beliefs and biases?). Apparently the home of our national Climate Change Research Institute has no evidence for global warming, so it’s asking a psychologist to explain that people who want to accept the mainstream theory of dangerous global warming are prevented from doing so by the mysterious psychology of belief. Click to see more. As this brochure manifests, mainstream scientists are resorting to casting doubt on the mental faculties of sceptics. It is extremely disappointing to see this evil practice reach New Zealand, since the root of the “problem of non-belief” is a lack of evidence. Yeah, that’ll help. Ignore our questions about recent long-term lack of warming, poor integrity of temperature records and disputed adjustments, uncertainty over climate sensitivity to CO2, sparse data for ocean warming and your continued evasion of honest inquiry—you’ll certainly establish the truth by maligning your critics as imbalanced. In theory, we have all learned Hume’s lesson, because a modest scepticism is the official philosophy of the modern sciences, which avow the maxim that every result is to be probed, repeatedly, and no truth may be admitted until it has stood the test of time. But, in fact, we have not learned his lesson. Nobody has time to wait and see whether yesterday’s experiment will still stand several decades from now. Life is short and writers have deadlines. So scepticism is a philosophy that is not easy to live up to. But who would want a philosophy that was? The global warming believers will put a psychologist in front of us to analyse our scepticism—our lack of belief. But a person’s belief is anchored in evidence and there has been no evidence for warming. There’s no mysterious psychology behind this contrary climate belief but rather the reality in observing 20 years of warming stasis. This paper uses a dynamic simulation model to situate the role of variables representing environmental processes in the social construction of the issues of climate change and global warming. In effect, it presents a quantitative dynamic simulation model of the social construction of a quasi-reality. By quasi-reality we mean a reality that thus far is defined by expert knowledge and is surrounded by uncertainty. A description of the model is followed by a demonstration employing a series of climate scenarios. Clearly there are many potentially serious limitations to the approach we have developed here, including the legitimacy of the postulates and the difficulty of acquiring suitable data for future calibration. However, in the broader context of promoting interdisciplinary efforts (necessary for increasingly geo-physical societal complexities), we hope, none the less, to have offered a demonstration of developing methodological possibilities. the average member of a society and its compounding effects on belief. For those from a physical science, maths or engineering background, this kind of stuff makes ones ears bleed. Reality may very well be a ‘social construct’, but only idiots ignore real-world evidence. I worked in a ‘social science’ department in a university many years ago and my ears never bled, but I used to laugh very heartily at the utter nonsense that floated about. Now, when I attempt tor read the stuff from my past, my brain wants me to go and do something satisfying such as gardening, baking a cake or painting a picture. The American term ‘circle-jerk’ comes to mind. Trying to shut down those who disagree by calling them mentally ill suggests they’ve lost the climate change debate. I notice they seem to be pulling out all the stops in the run up to Paris at the end of the year, because they know that if they can’t push climate change regulations through then that it’s all over. Last rattle of the dice for those pushing climate change, and they’re getting desperate. The mental illness tactic was used in the Soviet Union by those that went against the State driven pseudo-science of Lysenkoism. I understand, but this is a good find. The paper is incredibly complex, with strange diagrams and interminable lists and tables. It illustrates the complexity of the social issues that are interposed on our questions about the science. The discussion of belief systems in the audience seems to act as an outlet for the intense beliefs in the scientists that the earth is threatened and needs saving. Thus they assure each other that it’s all right to distort or invent the science as long as the message gets through to the public. There’s actually no lack of acumen in the lay audience to grasp the AGW message, but there is a lack of evidence available to persuade them. Take, for example, Freeman Dyson, one of the greatest minds in physics alive today, who practically invented quantum electrodynamics. The winner, or loser, of the debate will be whoever has made the correct, or incorrect, predictions whether warmy or denier or whether McCarthy thinks they are normal or not. 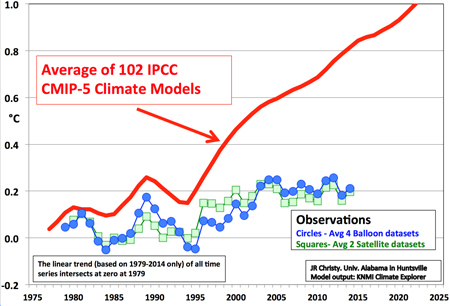 Right now CO2-centric climate science looks to be the loser given the tacitly admitted failure by the IPCC of their CO2-forced models (AR5 Chap 9, Box 9.2). And the climate of the earth is the final arbiter, not McCarthy or psychologists Wilson and Carter. Friends and colleagues describe Dyson as shy and self-effacing, with a contrarian streak that his friends find refreshing but his intellectual opponents find exasperating. “I have the sense that when consensus is forming like ice hardening on a lake, Dyson will do his best to chip at the ice”, Steven Weinberg said of him. His friend, the neurologist and author Oliver Sacks, said: “A favorite word of Freeman’s about doing science and being creative is the word ‘subversive’. He feels it’s rather important not only to be not orthodox, but to be subversive, and he’s done that all his life.” [clarification needed] In The God Delusion (2006), biologist Richard Dawkins criticized Dyson for accepting the religious Templeton Prize in 2000; “It would be taken as an endorsement of religion by one of the world’s most distinguished physicists.” However, Dyson declared in 2000 that he is a (non-denominational) Christian, and he has disagreed with Dawkins on several occasions, as when he criticized Dawkins’ understanding of evolution. Psychologists are irrelevant to the debate. Psychology is merely a sideshow outside the main tent, they’re just feeding off the frenzy. They are not radiative heating specialists, the critical issue, they can’t engage at that level so why listen to them or give them air time? They are adding nothing except for their own benefit and self-promotion. Climate scientists aren’t radiative heating specialists either – and here lies the root of the fallacy of their conjecture. Perhaps the psychologists should turn their attention to this fundamental problem. They may as well now because they will have to eventually – if they’ve still got the stomach for the topic when the theory is convincingly falsified, say around 2020. The blue circles are the average lower-atmospheric temperature changes from four different analyses of global weather balloon data, and the green squares are the average of the two widely accepted analyses of satellite-sensed temperature. Both of these are thought to be pretty solid because they come from calibrated instruments. If you look at data through 1995 the forecast appears to be doing quite well. That’s because the computer models appear to have, at least in essence, captured two periods of slight cooling. The key word is “appear.” The computer models are tuned to account for big volcanoes that are known to induce temporary cooling in the lower atmosphere. These would be the 1982 eruption of El Chichon in Mexico, and 1992’s spectacular Mt. Pinatubo, the biggest natural explosion on earth since Alaska’s Katmai in 1912. Since Pinatubo, the earth has been pretty quiescent, so that warming from increasing carbon dioxide should proceed unimpeded. Obviously, the spread between forecast and observed temperatures grows pretty much every year, and is now a yawning chasm. It’s impossible, as a scientist, to look at this graph and not rage at the destruction of science that is being wreaked by the inability of climatologists to look us in the eye and say perhaps the three most important words in life: we were wrong. Lionel Carter is not a psychologist but Professor of Marine Geology. Yes, training in social notions has been going on for decades now. The results are clearly seen in young adults. They find it ludicrous that one might question the idea that all men are equal, or that wealth should be shared regardless of the contribution made or not made towards its creation, yet they started as radical socialist notions shouted by student demonstrators just before they were hosed down by police. Well, after they had read the socialist books. Which I never did. So I don’t remember the names. Of the books, not the students. But still not a heat specialist i.e. he is no more able to argue the critical issue, radiative heating effect, than a psychologist. He can observe changes within his specialty and he can make a human attribution (assuming he does) based on IPCC reports and the “consensus” but that doesn’t make him correct just because he’s a Professor of Marine Geology. If the AGW theory is wrong his attribution is wrong – period. Lionel Carter may be a Professor of Marine Geology but is he an objective scientist in wider scope? Answer: definition of terms and attribution (the lecture is a redundant exercise). I believe in climate change but my attribution (natural process) is not in terms that the UN FCCC and IPCC define (and even those differ). Stephens et al (2012) in their global energy update stated a range of uncertainty in the surface budget of 34 W.m-2 2000 – 2010. Berkeley Labs (2015) found an empirical CO2 forcing of 0.2 W.m-2 at Oklahoma and Alaska 2000 – 2010. Loeb et al (2012) found a “steady” (no trend) 0.6 W.m-2 imbalance in the TOA budget 2001 – 2010. The effect of the CO2 “forcing” has not been detected at either surface or TOA i.e. it is negligible. IPCC AR5 Chap 3 Ocean: Observations was unable to find the “air-sea fluxes”, speculated to be the anthropogenic ocean warming mechanism in Chap 10 Detection and Attribution, among the noise of natural fluxes. Net LR surface flux is a cooling flux (OLR) anyway. The human fingerprint on climate has not even been identified outside natural variation, let alone “so” obvious. Why do they need to use “tricks to Hide the Decline”? Why do they need to make adjustments to records that are always in the up direction? Why do they need to run campaigns to get sceptical scientists sacked from their jobs? Why do they need to refer to respected physicists and other scientists as “deniers”? Why do they refuse to publish source data in the public domain? Why do they never ever correct some of the utter rubbish that passes as science these days? Why do they “need to get rid of the Medieval Warm Period”? Why do they need to use scare tactics? The scare is based on unconfirmed theory and unvalidated models. reality is catching out both. If it’s “so obvious” people will have already been convinced, models will have been validated by now, predictions will have started to come to fruition. What doubts could there possibly be? It is about the climate changing, isn’t it? Or has the issue been hijacked by a socialist agenda? If anyone watched the YouTube link of Backbenchers I posted a few days ago, you would see how the language has been corrupted around the subject. The question is completely nonsensical, yet he persisted in this line of questioning. This is why we now have a lecture by a psychologist and a marine geologist about “beliefs, biases and measures” when they probably only have, at best, a very sketchy knowledge of the core tenets of AGW theory which is tricky to get a fix on because there has never been formal documentation of the hypothesis (but we go with what we can – see below). Neither is the theory within the scope of their respective specialties. This is why I am adamant that it is the fundamental issues of the theory that are what is at stake, anything else is a sideshow and irrelevant. Scroll down and you get to the “greenhouse effect” (a misnomer if ever there was one). Next a statement “Without the greenhouse effect the earth would be about 30 C cooler”. The Slayers (PSI) are all over this one (no need to expand) [problem]. Other issue is that the temperature of the atmosphere has been estimated and confirmed from the earth’s surface to the top of the atmosphere without recourse to the greenhouse effect whatsoever [problem]. And meteorologists don’t bother with it for weather (temp, humidity, precipitation etc) because that’s just mass, gravity, pressure, altitude thermodynamics [problem, and why does the Meteorological Office not explain this], and climate being the aggregate of weather. OK, about that “overwhelming evidence”. And about that timeframe. Global warming theory proposes that CO2 traps longwave (infrared) radiation in the troposphere to reduce outgoing longwave radiation [OLR] to space. However, satellite measurements since 1975 indicate that global OLR has instead increased by about 1.3 Wm-2. This is in direct contradiction to global warming theory that “trapping” of radiation by CO2 should have instead reduced* OLR by .93 Wm-2 since 1975. The theory and “evidence” is riddled with problem points and contra evidence. And this has nothing at all to do with psychology or marine geology, or one storm in Wellington. Note that the theoretical 1975-2012 CO2 “forcing” of 0.93 W.m-2 (i.e. in respect to 1975 an increase from 0 to 0.93), is now greater than the estimated “steady” (Stephens et al, Loeb et al) radiative imbalance of 0.6 W.m-2 on average at TOA 2000 – 2010. In other words, increasing CO2 in the atmosphere has no effect on the earth’s energy budget at TOA. in global and tropical radiation budgets since 2000. This is NOT “overwhelming evidence” for man-made climate change, it is in fact contra-evidence to CO2 forcing theory, the underlying theory of man-made climate change. Denial despite overwhelming evidence is an example of cognitive dissonance which probably does need a psychologist to unravel. I wonder if Andy is tempted to apply for the job of Australian Windfarm Commissioner? He could be just the unbiased expert that Tony Abbot is looking for. Surely not every psychologist has gone to the dark side. What exactly is the “overwhelming evidence”, or any evidence Simon? As upthread evidence in terms of IR radiative forcing theory, the underlying theory of man-made climate change. A major problem for human attribution because there should be. Should be since this is is the period of the highest human CO2 emissions in the industrial era and CO2 “forcing” is currently increasing at 0.2 W.m-2 per decade (empirically, a little more theoretically). No detectible effect on the earth’s radiation budget by CO2 “forcing” means no evidence at all for man-made climate change because the underlying theory the MMCC conjecture is based on prescribes progressively decreasing OLR i.e. a progressively increasing TOA imbalance. Neither of these has been detected. OLR is increasing and the TOA imbalance is trendless. You can’t back up your claim in terms of the critical IR radiative forcing theory being confirmed with recourse to the IPCC as above. Confirmation is absent, no observational evidence at all let alone “overwhelming”. Counts me out as a “denier” of climate change Simon, who are you referring to? Cognitive dissonance appears to be on your part Simon. The MMCC Emperor has no clothes. Heh, heh! I love the metaphor. I like to taunt them by asking to see it. “All right, I’ll look in your bucket.” Onlookers eventually will note the continual lack of evidence. This “forcing” is supposed to be effective at TOA – it isn’t. MMCC theory has failed at the first hurdle, any other anecdotal “evidence” is moot (embarrassing for likes of Simon, Gareth Morgan, and UK Met Office). Using Mauna Loa data the theoretical CO2 “forcing” is now 1.24 W,m-2 1959 – 2014. Except it doesn’t “force” anything at TOA. The TOA imbalance is an on average trendless 0.6 W.m-2 2000 – 2010 (Stephens et al 2012, Loeb et al 2012, IPCC AR5 Chap 2). CO2 “forcing” is now double the TOA imbalance over the IPCC’s anthro attribution period. We could double CO2 levels in the atmosphere to 800ppm and it wouldn’t make any difference to the TOA energy budget. This, I think, needs to be shouted in Tim Groser’s ear. Not quite what you want but it’s past thesis level Hemi. Therefore the TOA budget is the primary, and only, (natural or anthro) climate change metric in UKMO terms. How they make this distinction when solar input to the planetary system continued to increase after 1940 to Grand Maximum levels 1958 – 2005 (except SC 20) is beyond me. Usoskin graphs this level as the highest for around 11,000 years. And solar input is still very close to that level. This is the simple explanation for the current stable TOA imbalance – the UKMO’s climate change metric. And, as upthread, easily proven to be untrue. CO2 “forcing” has had no forcing effect on the TOA budget – the UKMO’s climate change metric. EPIC FAIL for MMCC theory. Shades of insane asylums for Soviet dissidents.